Dome mirrors SATEL are produced with size Ø600mm, Ø800mm, Ø1000mm. At client request we can produce mirrors with sizes from Ø 200mm. Ø to 1200 mm. Satel dome mirrors are of excellent quality due to the quality of input materials and the optimized production process. 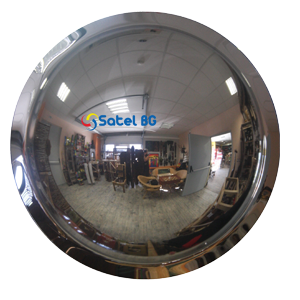 SATEL dome mirrors are used in shops, warehouses, airports, petrol stations, and for control at inaccessible places.